Provost Forrest Maltzman said relationships between University employees and students have the potential to create an imbalance of power. The Board of Trustees approved a new policy prohibiting student-faculty relationships Friday. The policy, which was first presented to the public at a Faculty Senate meeting earlier this month, will go into effect July 1. The new zero-tolerance policy prohibits “sexual or amorous relationships” between students and faculty, which officials said will prevent sexual harassment on campus and bring GW up to speed with peer schools. She said administrators began evaluating the consensual relationships policy when the University brought in the law firm Cozen O’Connor last summer to review Title IX policies amid increased scrutiny about the way the University handles cases of sexual misconduct. “We have seen universities struggle with this issue, so we felt it was important to have a policy that contains bright line rules prohibiting abuse of power in relationships with our students,” Laguerre-Brown said in an email. All of GW’s 12 peer schools have policies prohibiting student-faculty relationships, while more than half of the schools’ policies have been instituted in the past five years. He said the policy ensures that faculty and staff don’t use their position to “take advantage” of students. 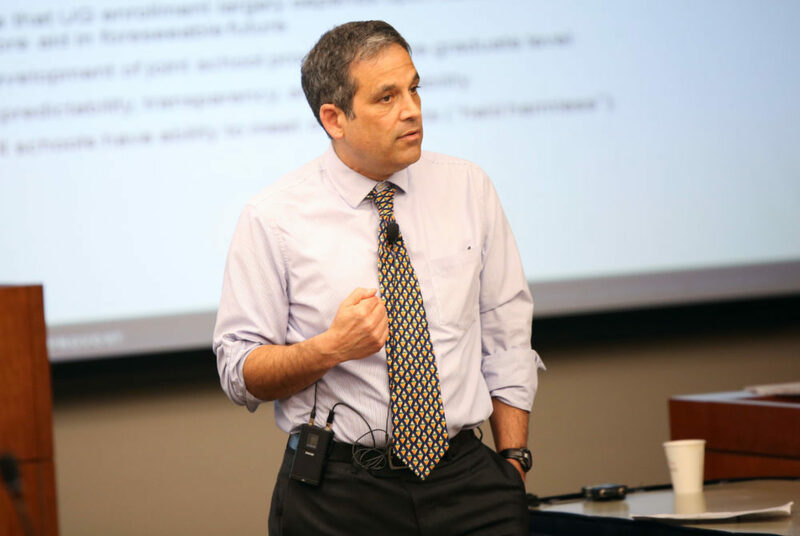 “Those who teach our students should have no relationships with any undergraduates, and students should be able to take full advantage of their curriculum without any sort of concern,” Maltzman said. Professors on the Faculty Senate’s professional ethics and academic freedom committee said they have provided input since January about the new policy but were never able to vote on a final draft. They said administrators rushed to finalize the policy and left out key information about what steps are taken if administrators are notified of a professor-student relationship. LeBlanc previously served as an administrator at the University of Rochester, which came under fire this academic year for a high-profile sexual harassment case involving nine researchers who sued the university for mishandling a student-faculty harassment case. “The idea of prohibiting amorous relationships where one person has power over the other seems like a good idea because it’s a way of avoiding, it’s nipping in the bud, this #MeToo type of thing,” Garris said. He added that while the new policy works to prevent sexual harassment and inappropriate relationships between faculty or staff and students, it fails to discuss “due process” – how parties should report incidents and what steps will be taken after a report is made. Laguerre-Brown, the vice provost for diversity, equity and community engagement, said that if administrators discover that a faculty member has been involved in a sexual relationship with a student, disciplinary procedures would be the same as they would be for other policy violations or misconduct at GW. Nicholas Kyriakopoulos, a professor of engineering and a member of the committee, said the new policy is a way for the University to protect itself in court if a sexual harassment case involving a student-faculty relationship arises because the policy now clearly prohibits such relationships. Experts said the policy is a step forward for GW, which now lays out clear guidelines for faculty and students to steer clear of relationships that could negatively impact academic interactions. Paul Thaler, the managing partner of the law firm Cohen, Seglias, Pallas, Greenhall, & Furman PC’s District office, said the new policy helps reinforce equal treatment on college campuses and ensures that inappropriate relationships won’t impact academics. Carly Mee, the interim executive director of SurvJustice, a nonprofit based in D.C. that advocates for survivors of sexual violence, said the new policy allows the University to go “one step further” than GW’s existing Title IX policies that protect students from sexual harassment. “It does ease those burdens on students and puts a little bit more power in their hands in terms of being able to come forward about inappropriate professors because on its face, it prohibits professors from doing that,” Mee said.